An international team of scientists has discovered the first evidence that a huge carnivorous dinosaur roamed southern Africa 200 million year ago. The team, which includes researchers from The University of Manchester, University of Cape Town, South Africa, and Universidade de São Paulo, Brazil, have found several three-toed footprints measuring 57cm long and 50cm wide. This means the dinosaur would have an estimated body length of around nine metres (30 feet) and be a little less than three metres tall at the hip. That’s four times the size of a lion, which is currently the largest carnivore in southern Africa. The footprints belong to a new species, named Kayentapus ambrokholohali*, which is part of the group of dinosaurs called “megatheropod”. The term “Megatheropods” describes the giant two-legged carnivorous dinosaurs, such as the iconic Tyrannosaurus rex (T. rex) which fossil evidence shows was around 12 metres long. 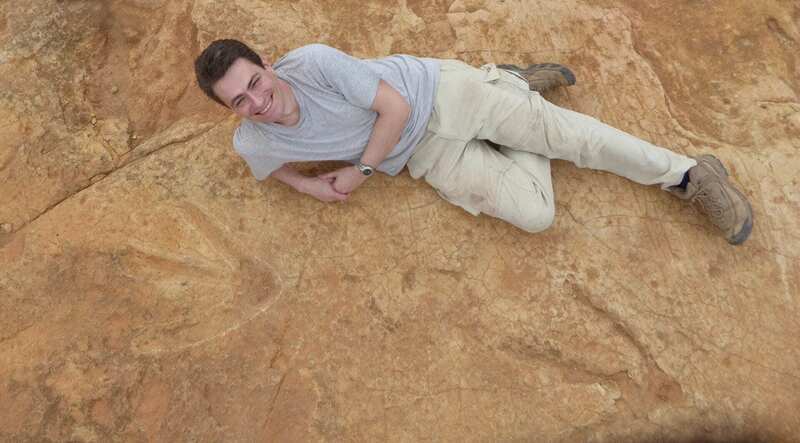 This study, which is published in PLOS ONE today (Wednesday 25th October), also reveals that these footprints make up the largest theropod tracks in Africa. The tracks were found on an ancient land surface, known as a palaeosurface, in the Maseru District of Lesotho, a small country in southern Africa. The surface is covered in 200 million years old ‘current-ripple marks’ and ‘desiccation cracks’ which are signs of a prehistoric watering hole or river bank. Dr Fabien Knoll, Senior Research Fellow at The University of Manchester, said: ‘The latest discovery is very exciting and sheds new light on the kind of carnivore that roamed what is now southern Africa. What makes the discovery even more important is that these footprints date back to the Early Jurassic epoch, when it was thought the size of most theropod dinosaurs was considerably smaller. On average they were previously thought to be around three to five metres in body length, with some records showing they may have reached seven metres at the very most. It is only much later in the Jurassic and during the Cretaceous, which starts 145 million years ago, that truly large forms of theropods, such as T. rex, appear in body and trace fossil records. The ancient surface where these footprints were found is also covered with the tracks of much smaller theropod dinosaurs.